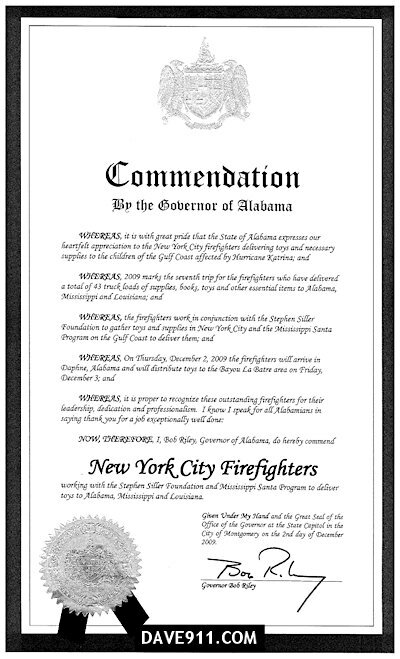 MONTGOMERY – Governor Bob Riley has signed a proclamation commending 32 New York City firefighters for delivering toys to children of Alabama and Mississippi. The firefighters are expected to arrive in Daphne on Thursday and distribute toys in the Bayou La Batre area on Friday. After Hurricane Katrina hit the Gulf Coast in 2005, a group of New York City Firefighters came to Alabama and Mississippi to deliver vital supplies to those in need. What started out as a mission to help people recover from the hurricane has now become a new holiday tradition that eases the burden for those less fortunate. In the years since Hurricane Katrina, the firefighters have delivered a total of 43 truck loads of supplies, books, toys and other essential items. This year, they will return with eight truckloads for children in the Bayou La Batre area and in Mississippi. The firefighters work in conjunction with the Stephen Siller Foundation to gather toys in New York City and the Katrina Kids Toys/Mississippi Santa Program to deliver the toys to children on the Gulf Coast. After delivering toys to Bayou La Batre, the firefighters will then travel to Mississippi and New Orleans.